The honeymoon is over for Italy’s populist government and the country’s entrepreneurs, as business owners and managers in the prosperous north voice concern, and even anger, over policies and budget plans from the five month-old coalition. After Carlo Bonomi, head of regional-industry lobby Assolombarda, got a standing ovation at Milan’s La Scala theater for lighting into Finance Minister Giovanni Tria over the government’s budget plan, analysts are asking how much longer the League can count on support from business leaders, as the party forges compromises with its anti-establishment partner, the Five Star Movement. The influence of Five Star, which made its name by railing against the excesses of capitalism, has entrepreneurs ready to draw a line in the sand — and demand that the League stand up to its partner. “We must say ‘no’ to a state that wants to close shops on Sunday, ‘no’ to a state that wants to re-nationalize air transport, ‘no’ to a state that’s against infrastructure spending and wants to revoke concessions,” Bonomi said at Assolombarda’s annual assembly at La Scala Oct. 18. Tria attended as a guest of the association, whose membership is a “Who’s Who” of Italian industry, including management of heavyweights like oil major Eni SpA and ex-telecoms monopolist Telecom Italia SpA. Corporate leaders have reason to be worried. Manufacturing shrank the most in almost four years in October after the Italian economy failed to grow in the third quarter, and unemployment jumped back above 10 percent in September, 2 percentage points above the euro-area average. The European Commission now forecasts that Italy will have the slowest growth rate in the 19-nation euro area in 2019 and 2020. The dissent is loudest in regions where the League’s pro-business, low-tax message resonated the most during the March national elections. The League, led by Deputy Prime Minister Matteo Salvini, dominated the vote in the north, an arc stretching across the country from the auto-making center of Turin to the financial capital of Milan, to the entrepreneurial stronghold of Veneto. While the League continues to surge in opinion polls — it’s now Italy’s top party based on the most recent data — an index of confidence in the coalition led by Prime Minister Giuseppe Conte fell to a record low in November, according to an SWG poll for TG LA7. The main cause of voter angst: next year’s proposed budget, a precarious compromise between the League and the leftist Five Star. “La manovra,” as the budget is known, is viewed negatively by 60 percent of the League’s base in the wealthy northeast, according to a Demos & Pi poll for daily la Repubblica. The budget sparked “a sharp change in expectations among local entrepreneurs due to uncertainty brought in by the new government and measures they’ve announced,” said Luciano Vescovi, head of industry association Confindustria for Vicenza, a city 80 kilometers (50 miles) east of Venice. The push and pull between the coalition members and the lack of clarity on what the economy will look like in 2019 is making businesses hesitant to invest. Concerns among institutional investors appear to match what business people are saying. 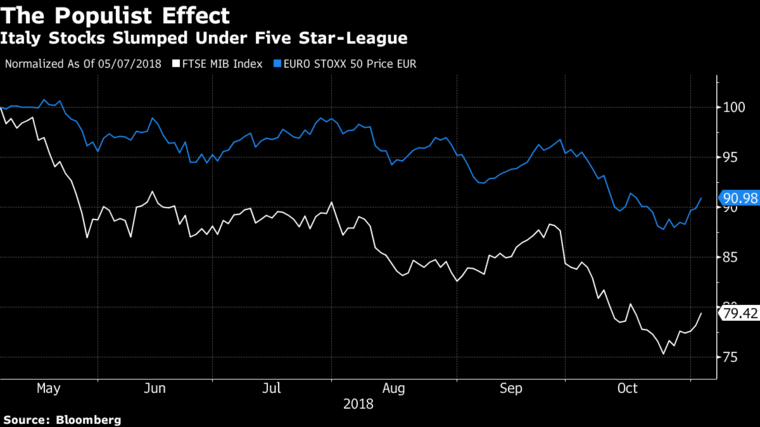 Since Five Star and the League started talks to form a government in early May, Italy’s benchmark FTSE MIB index has lost more than 20 percent, entering into a so-called bear market. In the same period, the yield spread between benchmark 10-year Italian government bond and their German counterparts has more than doubled. In industrial centers like Turin, home of Fiat Chrysler SpA, apprehension about the budget’s effects on the economy have mixed with anger over Five Star-driven policies that don’t sit well with local businesses. After Turin’s Five Star-led city government voted to try to block works on the TAV high-speed rail link with France, businesses teamed up with unions to protest. The League fanned the flames, making no secret of its support for TAV, even after Five Star reiterated its opposition. “Adesso Basta,” a Turin business group whose name translates roughly as “Enough Already,” has called for a mass march Nov. 10 to protest. “Unsustainable, paradoxical, absurd and dangerous,” the organization’s leader Corrado Alberto said in describing the government’s current direction.